Genesis is a CNC-Automatic cutter designed for a medium duty manufacturing applications and thanks to its flexibility it is able to cut a wide range of fabrics and technical textile. Moreover it can be easily interfaced with all major software available on the market. High speed and acceleration allow cutting even complex shapes. The machine can support a 3-axis multi-tool head with either fixed or a pizza-wheel blade and it even supports a high-speed inkjet printing head to print logo or bar-code directly on the material. 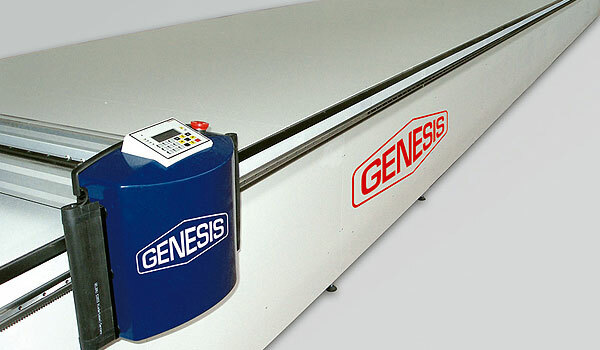 The Genesis can operate with a laser cutting head or a router where the application demands. Genesis uses all the latest computer controls and drive technology. The vacuum cutting table is strong and adjustable, and can be adapted to a wide variety of compact work environments where space is concern. It uses a high precision linear bearing and rail system with self lubricated bearings requiring no maintenance. Besides the high-powered motors, rack and pinion drive system make the machine’s length virtually unlimited. The machine includes a “safe edge” rubber protection system keeping the operator safe from moving components. All these advanced features are supported economically while Genesis remains almost maintenance free and supports on-line remote servicing and diagnostics.